The very sad news just broke that Dom DeLuise has passed away at the age of 75. Once upon a time, this guy was everywhere! DeLuise played Buddy Bizarre, the movie director toward the end of Blazing Saddles (yeah the one who got punched in the gut by Slim Pickens). DeLuise did a bunch of other movies for Mel Brooks too, like Spaceballs (as the voice of Pizza the Hutt) and Silent Movie, a film which I've always thought was one of the funniest of the Seventies. Not long after that DeLuise became a frequent co-star with Burt Reynolds, in such comedy fare as The Cannonball Run, the second Smokey and the Bandit flick and The Best Little Whorehouse in Texas. Well, what else can I say? The guy was hilarious. DeLuise always lit up every scene that he was in. He just seemed gifted for that, with his voice and beaming smile. He's survived by his wife of 43 years, their three sons and several grandchildren. Our thoughts and prayers go out to them. Rest in peace Dom. And thanks for all the laughs. 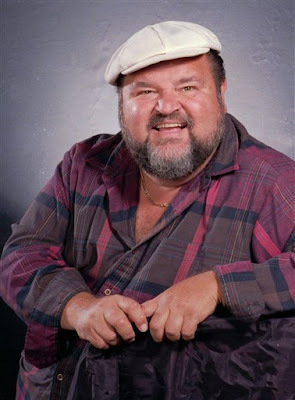 I just learned that Dom DeLuise-died last night in a Los Angeles hospital. Mr. DeLuise, you sir have made many people laugh in you lifetime and will continue to do so for years to come. This proves one thing . . . .
Those whom the world tags as "obese" (although probably no one would have said it to the face of the GREAT Dom DeLuise) can and DO live long, productive lives. They don't get wrinkles as they age either.